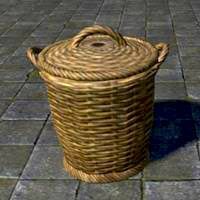 Common Basket, Tall is a fine (green) quality Furniture in The Elder Scrolls Online. Crafted, Clothing Station. Requires Pattern: Common Basket, Tall. Patterns are found randomly in containers around tamriel, and can be traded and sold by players. Some special patterns are only available from pickpocketing or as special rewards. Houses: Autumn's-Gate, Barbed Hook Private Room, Daggerfall Overlook, Domus Phrasticus, Earthtear Cavern, Ebonheart Chateau, Exorcised Coven Cottage, Forsaken Stronghold, Gardner House, Grand Topal Hideaway, Grymharth's Woe, Hakkvild's High Hall, House of the Silent Magnifico, Hunding's Palatial Hall, Mathiisen Manor, Moonmirth House, Mournoth Keep, Old Mistveil Manor, Pariah's Pinnacle, Quondam Indorilia, Ravenhurst, Serenity Falls Estate, Snugpod, Stay-Moist Mansion, Tel Galen Tower and Velothi Reverie.